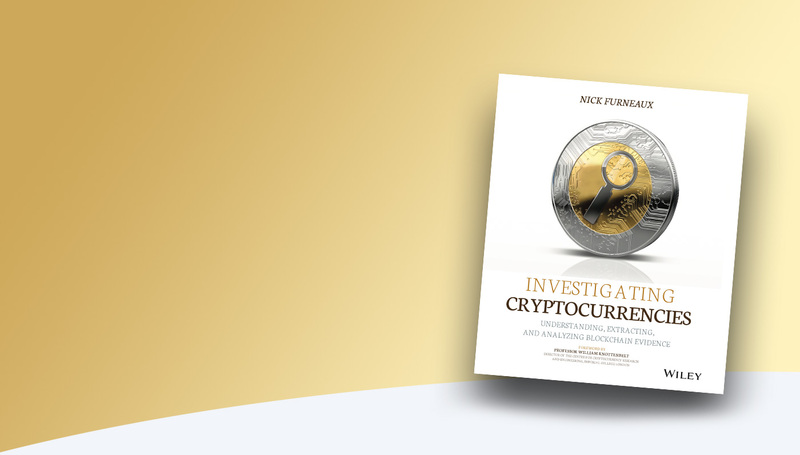 An essential guide aimed at investigators for understanding, extracting and analyzing cryptocurrency evidence. This site will give you access to scripts used in the book and also new scripts and tools as they become available. You can also find corrections and additions to the book which will be written as new techniques are developed. This book was such a good read I had a hard time putting it down. The chapters flow nicely, and I found the content was very well structured with many step-by-step examples that solidify the skills learned. The author clearly communicates the concepts being explained and the examples always provided me with the clarity I needed whenever I found myself in doubt. Numerous illustrations and screenshots are also provided throughout the book which greatly assist the reader with understanding the concepts being taught. With that said, I did notice there were a few screenshots where the text was hard to read. This could possibly have been a printing issue with just my book, and I’m happy to say they did not detract from my ability to understand the content. While I’m not a digital investigator I do believe Nick Furneaux has done a fantastic job of taking what some might view as a challenging topic and breaking it down into small, easy to comprehend pieces. I believe that anyone with little to no cryptocurrency experience can become confident in carrying out their own cryptocurrency investigations with the help from this book and a little practice. This book was not what I expected, but that is my fault. This book is actually what it says it is, a book on how to investigate cryptocurrencies. I thought that was just a new title in to use to catch our attention since there are now so many books out on Bitcoin, Ethereum, and other Cryptocurrencies. I figured it would just delve into the technical details of how Bitcoin, Ethereum, and other Cryptocurrencies work. The book is written for investigators, like police and financial investigators. When I hit Chapter 8 and they went into searching premises, I thought I was done with the book. As I read on, I just kept reading on, and on, and on. This book really would be good to distribute to different investigator groups, especially if they know nothing about Cryptocurrency. They may however want to start in Part II because the author did a great job of digging deep into the technology behind Cryptocurrencies. As far as seasoned Cryptocurrency developers, users, etc., go, I don't know how much new things I learned but I did learn how to see the Cryptocurrency world from a different perspective. I have read books coming from a lot of different perspectives including the value of trust, Bitcoin only, Ethereum only, language and tools only (Python, Solidity, Truffle, etc. ), Blockchain, the law, Hyperledger, and I think this view is well worth the read. The author has a great writing style that keeps the topics interesting and is able to explain some very complex things in a way that makes them easy to understand. Although he has sidebars, they are always related to the topic and they are interesting. They add value, no fluff. All in all I highly recommend this book to anyone interested in Bitcoin, Ethereum, and other Cryptocurrencies. I do cryptocurrency investigations for a government agency and this book touches on everything an investigator needs to know when first getting into the crypto space. I even learned some new tricks I'll be sure to try. The flow of the book was perfect and the author did a great job in presenting everything. I will definitely give this book out to my students when I teach a cryptocurrency class. If you just started doing cryptocurrency investigations, then this is the book to read FIRST. Two thumbs up! Excellent book! Well written and easy to understand, Highly recommend reading this book. Having sat Nick’s digital forensics training in the past I was keen to read Investigating Cryptocurrencies. The book is an outstanding introduction to the world of cryptocurrency crime and is written in a way that an investigator will appreciate. About a third of the book is helping the reader to understand how cryptocurrencies, especially Bitcoin, works, and then we learn how to locate evidence, build an evidential picture and follow coins through the blockchain. The book was technical to an appropriate degree and I especially appreciated the tools and small python scripts that are included. There are parts of the book that lend themselves to an understanding of digital forensics/cyber crime but my colleague who is an non-technical Financial Investigator is half way through the book and is enjoying it immensely. Nick described the book to me as a ‘starter for 10’ and I would agree, this book gets you off the starting blocks investigating crimes involving cryptocurrencies but a follow up book to take me even further would be brilliant!